The Scottish Conservatives want a review of the ban on the sale of alcohol at Scottish football matches. The Tories said the rules may be "out of date" and are writing to every senior football club in Scotland seeking their views. Police Scotland said it opposed any relaxation of restrictions while the SFA said it welcomed debate. 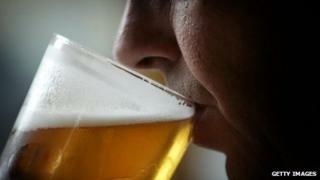 In England, alcohol can be consumed before matches and at half-time inside football stadia. Fans south of the border can buy a drink on the concourses at designated times during and after games, but are not allowed to take alcohol back to their seats. It is possible to drink alcohol at other sporting events in Scotland, such as rugby union. However, at football matches alcohol can only be consumed in corporate hospitality areas, although not during the game itself. The SFA said: "We welcome the opportunity to have a sensible and robust discussion on the subject." Scottish Conservative leader Ruth Davidson said: "I understand why the ban was brought in all those years ago, but times have changed significantly since then. "We now have modern stadia with excellent stewarding to keep spectators safer, allowing more families to attend matches. "This has resulted in the football-watching experience being a far more civilised experience than it was 30 years ago." She added: "There's no reason why this should be successfully in place in England but not north of the border. "It seems unfair that people who can have a drink in a bar, rugby ground or even at a concert in football stadiums are unable to consume alcohol before they sit down to watch a game of football." Ms Davidson said that a change could bring extra revenue to some cash-strapped clubs. A Scottish government spokesperson said: "We are committed to ensuring that football fans can enjoy our national sport in a safe, enjoyable environment and have no plans at this time to remove the existing restrictions on alcohol at football."